Flea market find yields helpful advice, recipes from 1890s Philadelphia. By Johnny Goodtimes·	 5/15/2012, 9:00 a.m.
Let’s say that your child has developed an earache, and you are preparing to pour some milk down the child’s ear. Not so fast! Care of Child’s Ears. Never put milk, fat or any oily substances into the ear for relief of pain, for they soon become rancid. Too late. I already put lard in my child’s ear and now a bug has flown into it and gotten stuck. What to do now? A few puffs of tobacco smoke blown into the ear will stupefy the insect. I never worry about bugs flying into children’s heads, as long as I am able to keep them in a stupor. Man, all of this talk about bugs and milk has gotten me stressed out. How can I relieve my stress and prove what a patriot I am at the same time? Singing for Health. Singing is highly recommended as a nerve tonic, and justly … When the world looks bleak and affairs go wrong sing “The Star Spangled Banner” at the full compass of your voice. If you sing it every morning the neighbors will become used to it. Yes, the neighbors will become used to the fact that you are completely batshit crazy. Let’s look at some recipes! Beef juice. Cut a thin, juicy steak into pieces 1 1/2 inches square. Brown separately 1 1/2 minutes on each side before a hot fire … flavor with salt and pepper. May add to milk or pour on toast. Pour small strips of steak onto toasted bread, then top it with salt and pepper? That will never catch on in Philadelphia. But adding steak to milk? I think we’re onto something. Steak-O’s, the way Philly does breakfast! But what if you down some Steak-O’s and start choking? How will you save yourself? A Sure Relief for Choking. Immediately reverse the upright position of the body, supported by the hands and feet elevated, when instant relief will be obtained and the obstruction will fall from the mouth. According to the 1897 almanac, handstands relieve choking. If that doesn’t work, try cartwheels! So you’re feeling much better after that choking scare, but your canary isn’t. He’s got asthma. What should you do? Cure for Asthmatic Canaries. Give one teaspoonful of good whiskey, soak piece of sponge cake in it. Give twice a week. Whiskey and sponge cake? I’m feeling a bit tubercular myself. I might have a nip, just to be safe. But what if I drink too much whiskey? The Evils From Drinking Alcoholic Preparations: A writer in France says that the consumption of alcohol in that country is degrading the people mentally, morally and physically, refilling the hospitals, asylums, and prisons. As if that wasn’t bad enough, those asylums and hospitals are also chock-full of asthmatic canaries! * Furthermore, the ashtmatic canary has apparently given me a cold. How should I treat it? Toast Water. Toast three slices of stale bread to dark brown, but do not burn. Put into pitcher; pour over them a quart of boiling water; cover closely and let stand on ice until cold; strain. May add wine and sugar. Yeah, if I’m drinking water mixed with stale bread, you can be damn sure I’ll be adding wine. Plenty of it. Then I’m heading to the store. 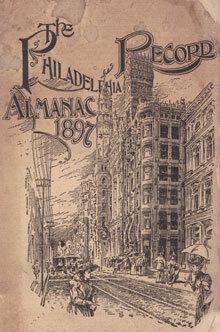 According to this ad in my almanac, I can go to John Bower and Co. at 24th and Brown. 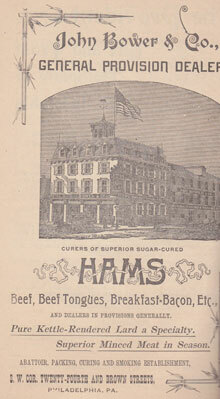 It says, “Pure Kettle-Rendered Lard a Specialty.” Perfect. Our youngster has an earache.